Witching Hour Studios, from Singapore, has an uncanny ability to make games that seem to be designed for me personally. Ravenmark, from a couple of years ago, is exactly the kind of strategy game that, were I to make a game myself, would be aiming for. Related reading: Also from Witching Hour Studios is Ravenmark, and it too is sublime. Harvard's review for the game on PC. 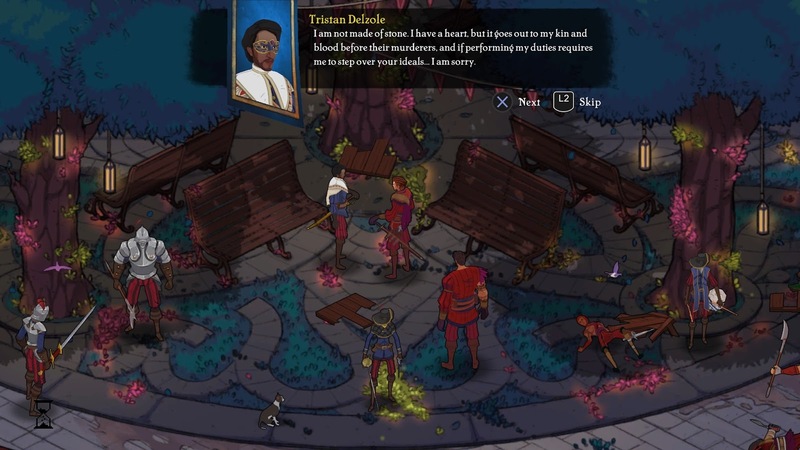 Masquerada is even more my kind of game. 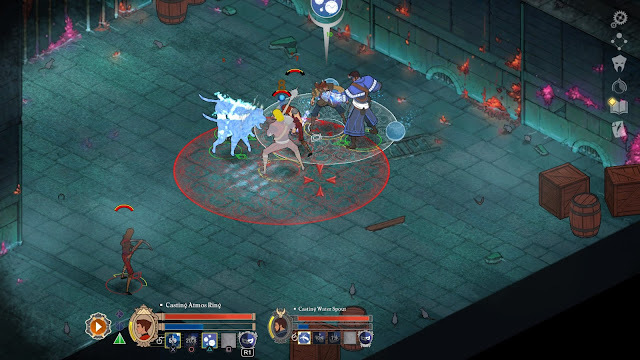 Masquerada is a fusion of high art - stuff like opera and masked balls - and deep, intense, story-driven fantasy. It’s also inspired by Venetian cloak-and-daggers fantasy, and boy oh boy did I love that kind of swashbuckling as a kid. All my Dungeons & Dragons characters for many years were variations on the hero with a rapier in one hand, a main gauche in the other, and a flamboyant style where she (always she) would also use her cloak and athleticism to misdirect and confound her opponents. Masquerada is all of those things wrapped into a neat package with a reasonable play time, and as such it was something I just couldn’t put down. 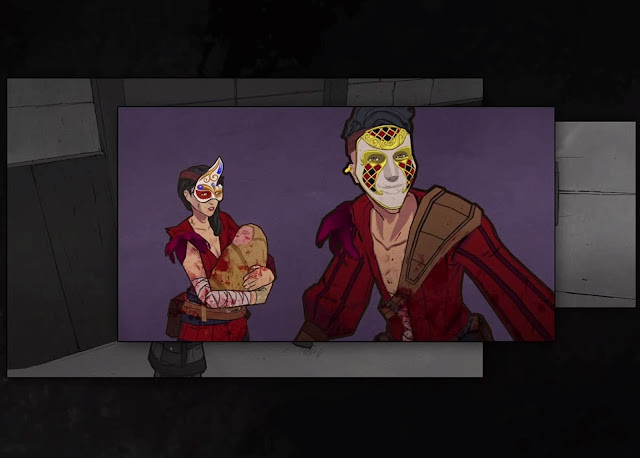 The primary theme in Masquerada is class; the haves and haves not. The cultured, and the intelligentsia and those who labour as slaves in all but name. 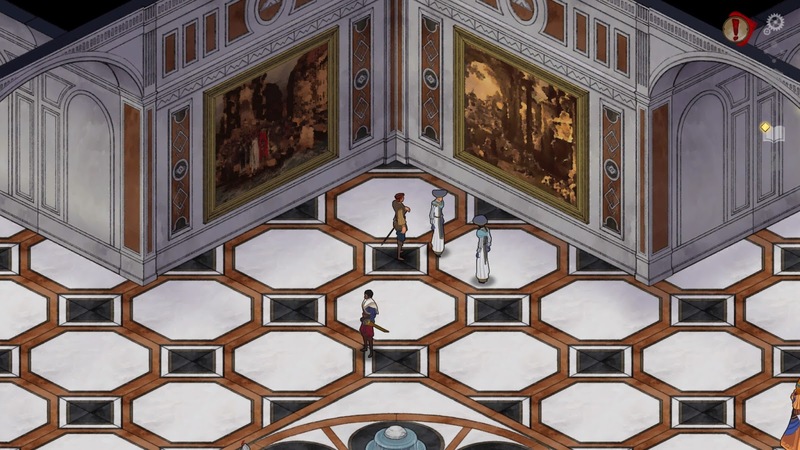 Masquerada presents us with a glorious glistening city in which the fortunate enjoy soaring architecture, rich fashion, beautiful paintings. It’s a game where, in the background, the wonderful tonal depth of opera music sets the atmosphere of majesty and power… and then it presents the other side. At first we’re meant to see them as traitors and enemies. They’re called “Maskrunners” and they are, in theory, thieves and bandits. They are the city’s poor, and they are rebellious and violent. In fact, a noble blood relative to the game’s hero, Cicero, was killed in the prologue for sparking the rebellion by turning traitor and helping the Maskrunners out. The Maskrunner’s greatest crime was in stealing rare, precious masks that people can don in order to obtain incredible magical powers. But there’s a catch; these masks are a finite resource, and if a person dies while wearing one, the mask itself fades into oblivion. In stealing a large number of masks and then getting killed wearing them, the global supply of these masks is dwindling dangerously low, and the elite simply cannot forgive the unwashed masses for consuming their resources. Worse, as far as the elites are concerned, stealing those masks was a hit to the source of their wealth and source of power. It is through the masks that the elites are able to maintain control over the population (thanks to the magic they provide), and with the number of masks dwindling, the threat of revolution looms ever more real. Just as real-world political leaders look to protect their resources - the mining and media corporations that keep their parties showered in cash - so too do Masquerada’s elite fight tooth and nail to protect their resources from being co-opted by the meek. And the labyrinthine nature of Masquerada’s politics and hierarchies only becomes more convoluted and, to think about things rationally, ridiculous from there. 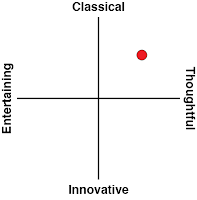 There are various levels of elites, and some castes simply would not deign themselves to associate with lower castes. Everyone has arbitrary clothing and accompaniments that are designed to associate with their own group, but distance themselves from others. It doesn’t take long for the entire organisation around these elites to descend into a farce of arrogance and oneupmanship, where any pretences for governing the people (for the elites are indeed the government), is quickly thrown out of the window by almost every individual in deference to selfish goals and playing the great game of thrones (no, not the book, the phrase). It’s all beautiful, with the most graceful hand-drawn art style you would have seen in videogames to date. But it’s also a sorrowful kind of beauty - and this is why the operatic themes in the music are so perfectly suitable - in which there is a sinister underbelly to the world, overt corruption is rife, and the basic principles of humanity are often cast aside for all the shadowy deals and intrigues going on in the background. Masks in the real world were historically worn to conceal a person’s identity, to free him/her of inhibitions and allow everyone on the ballroom floor to dance as equals. It’s the perfect motif for this game; not because people are dancing, but rather weaving monstrous webs of plots and back stabbings, uninhibited by concepts of morality by liberating themselves from the humanity within themselves by wearing a mask. In a real world where class wars have erupted all over the place, and people’s faith in their elites - once represented by monarchs, now by political dynasties - has never ebbed lower, Masquerada tells a story that, for all its callbacks to renaissance Europe and fantasy, is incredibly modern and relevant. And perhaps that’s why it feels so chilling to play. For all that beauty and majesty, there is a sense of inescapable claustrophobia that kicks in and slowly builds into something quite intense. 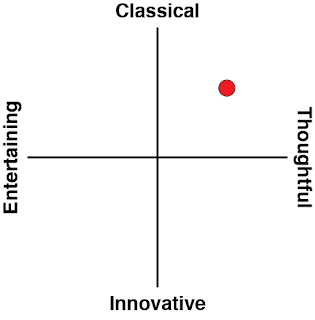 Perhaps that’s why I found the game’s linearity so compelling. I’ve seen plenty of others disparage Masquerada for being the most focused RPG this side of Final Fantasy XIII, and indeed you do spend almost the entire game following a very set path (often an actual path on the road) from one objective to the next. It feels restricted and, at first, given I was so incredibly invested in the lore and art, I did want to explore, but as the game moved on, that metaphoric leash started to make sense; none of the characters are truly free, so deeply controlled as they are from the oppressive (but beautiful) society. Why should we be free as players? So claustrophobic are the webs of intrigue wrapped around each character that they must feel like they are suffocating… so why should we be able to take in a deep breath and feel free? Masquerada offers truly intelligent game design that understands how to make the “gameplay” reinforce and support the narrative. The game’s combat feels like one of those “real-time-but-pause-whenever-you-like” RPG systems, popularised by the Dragon Age series. Each battle will play out quite quickly if you let it. Alternatively, you can pause the action at any point and issue orders to your characters. Truth be told, the system is quite simple and not the highlight of the game, but it does what it needs to do to break up the narrative sections, and certainly Masquerada never feels like a game like Torment: Tides of Numenera, in which it’s possible to forget there’s a combat system at all. The other reason that Masquerada benefits from its combat system is in helping to build the personalities of each character which joins your troupe, as they all have their own unique styles, and in the absence of detailed character models (a consequence of the isometric perspective we have on the game), this helps distinguish each character from one another and gives them all personality. 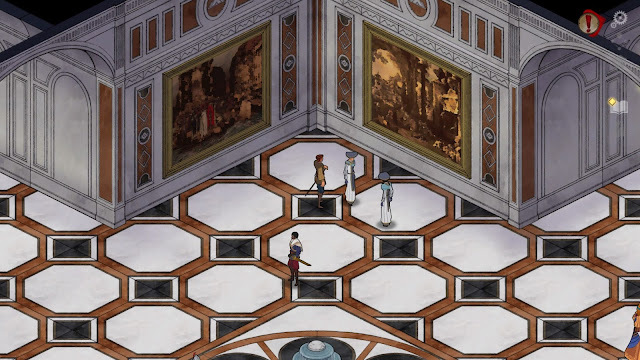 Masquerada’s more superficial elements are all quite incredible, too. As I’ve mentioned so many times in the review already, it is a beautiful, beautiful game; one of the real highlights in a year of released that has included stuff like Persona 5. The hand drawn aesthetics are distinct, visionary, and powerful, albeit perhaps a little too subtle for everyone’s tastes. The story itself is the video game equivalent to a page-turner, kicking off with a missing person’s mystery and it fits the cloak-and-dagger setting just perfectly. The music is just breathtaking if you’ve ever enjoyed opera before, and the voice acting… well, somehow for an indie studio Witching Hour Games was able to pull together Felicia Day, Matt Mercer, Jennifer Hale, Dave Fennoy and Ashly Burch, and that’s about as all-star as games get outside of the blockbuster space. Masquerada is a rare gem of a game in which everything about it comes together just perfectly to give plays a consistent and cohesive experience. Sure it’s possible to rue its relatively short running time (at 20 hours, this is a short RPG), particularly when the lore is so deep that you’ll want to dig deeper into it all. And, yes, it’s a hyper-linear game at a time where “good game design” apparently means “arbitrary open world.” But these “faults” drive home the point and purpose of the game, and as a narrative experience, Masquerada is truly wonderful.